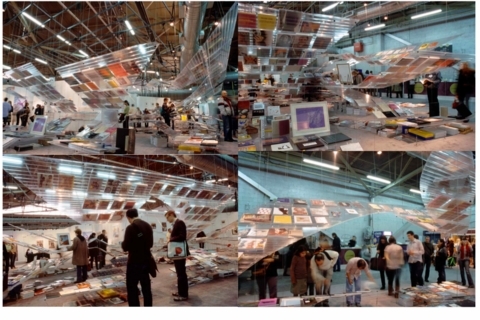 Sponsored by Jeffrey Deitch, VIto Acconci's Open Bookstore installation for ARTBOOK @ The Armory in 2007 was cited in the media as one of the top highlights of the fair that year. 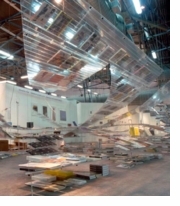 Occupying some 4,000 square feet the installation was suspended from wire panels creating an archipelago of shelving islands for book display. Team members from Acconci Studio, ARTBOOK, and Pier 94 worked day and night to realize this inaugural installation of Acconci's Open Bookstore design. 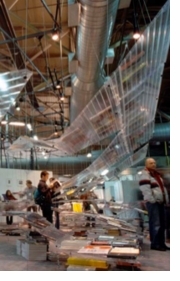 Assembled in a mere four days, the installation used semi-transparent cut and folded plastic panels suspended on wire cables from the ceiling of the pier at The Armory. 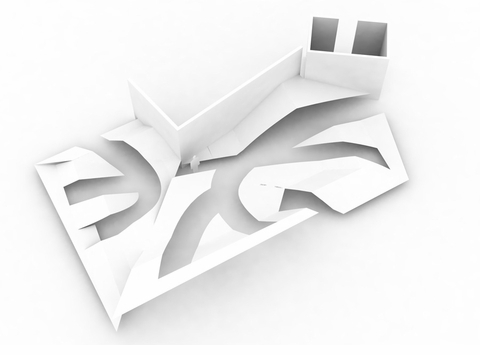 A preliminary folded paper model of the Open Bookstore. 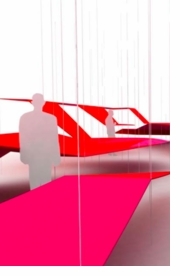 Computer-assisted concept rendering of the shelving system: a single large plane die-cut, folded and suspended from the the ceiling to create shelving "islands." Installation photograph showing the vertical cable suspension system from the ceiling of the pier. The design proved surprisingly functional in practice, combining visual display in the upper tiers with easily accessible browsing on the lower shelving planes.